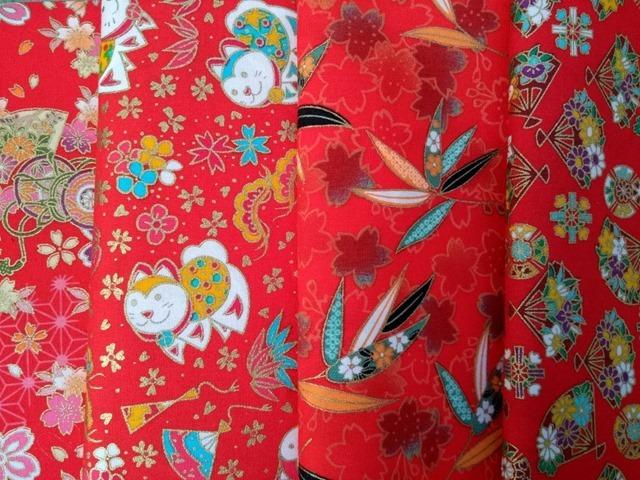 I do love it when my daughter goes off travelling because she always find gorgeous fabric for me. She likes to travel light which means there’s usually room in her luggage for lots of treats. She was in China for the New Year Festival and there were loads fantastic of red decorations everywhere. Red symbolises good luck. 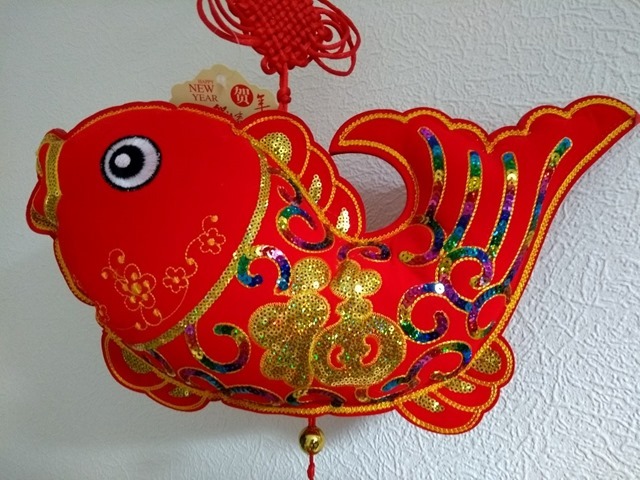 How lucky I was to be presented with this New Year’s fabulous fish! I love the rainbow sequins and all the sparkly bling 🙂 As you can see, it hangs from a very special knot. There’s also a long thick double tassle hanging underneath which isn’t in the photo. It might be a Chinese New Year decoration but it’s going to hang in my dining room all year because it makes me smile. 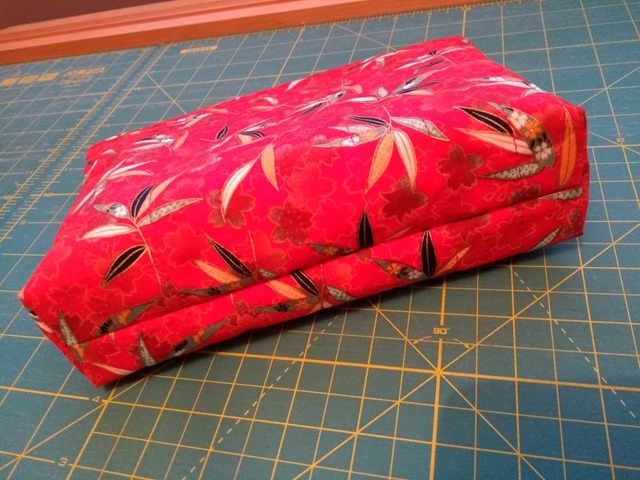 My daughter knows I love things made from fabric so she also brought me a fabric tray. 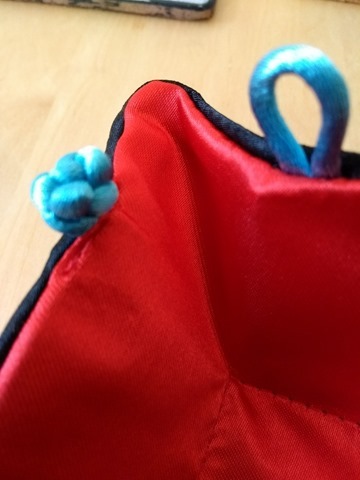 The sides are pulled together at the corners with a thick cord knot and loop fastening. 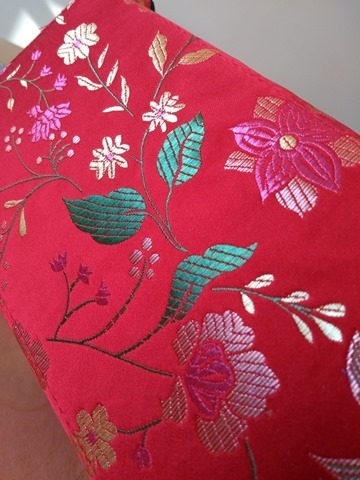 The machine embroidered outer fabric is very pretty but I’ve realised I can’t see it when the tray is in use so I’m going to turn it inside out and have the bonny side inside. 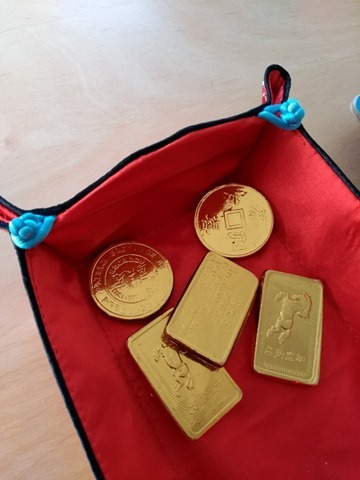 It came with some Chinese chocolate coins. YUM! Loop and knot corner fastening. 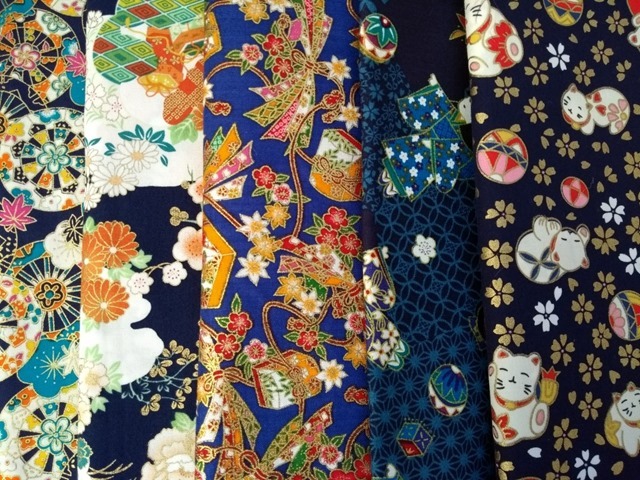 Even though my daughter was travelling around China and stayed in several places, she didn’t come across any shops or markets that sold fabric suitable for patchwork. However, a trip across the water to Taiwan changed all that. Bingo! Here’s my haul, starting with a couple of purple designs. All the fabrics have a touch of metallic. 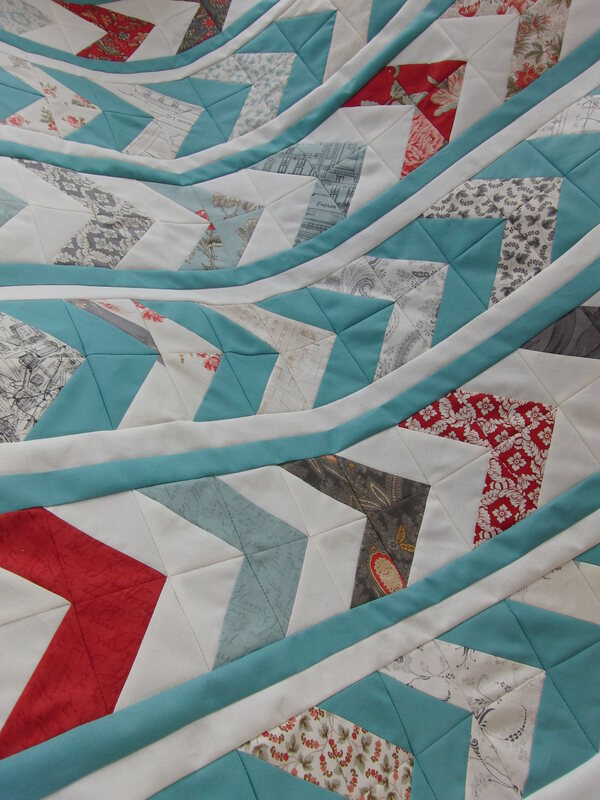 It’s all lovely patchwork cotton quality and I’m so pleased with it. I have no idea what to make (apart from a gift, see further down). 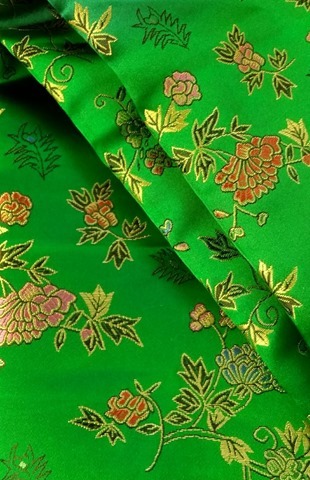 My daughter loves green so she treated herself to this embroidered silk fabric with a challenge to me to make something for her. It’s actually a much darker, richer green in real life. 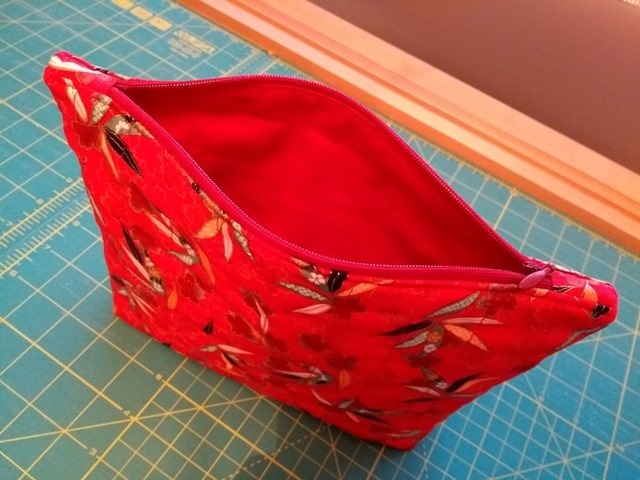 The lining is in Christmas Red from Moda Bella Solids. Here it is posing on my Singer 🙂 There’s also another present in this photo. I’ll tell you all about it later. 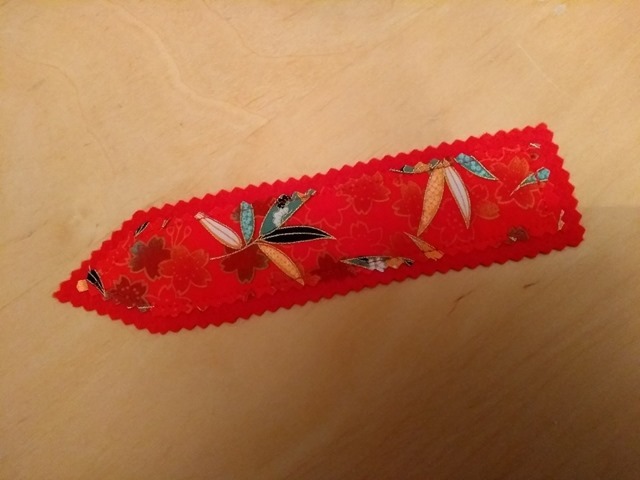 I included a scrappy bookmark for good measure. 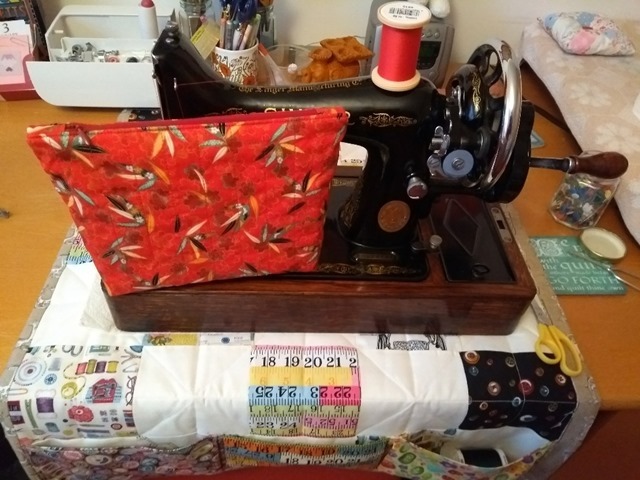 The old machine made light work of the quilting, inserting the zipper and stitching through all the thicknesses including the lining. I had fun putting it through its paces. That Book Made Me Do It! What lovely loot! 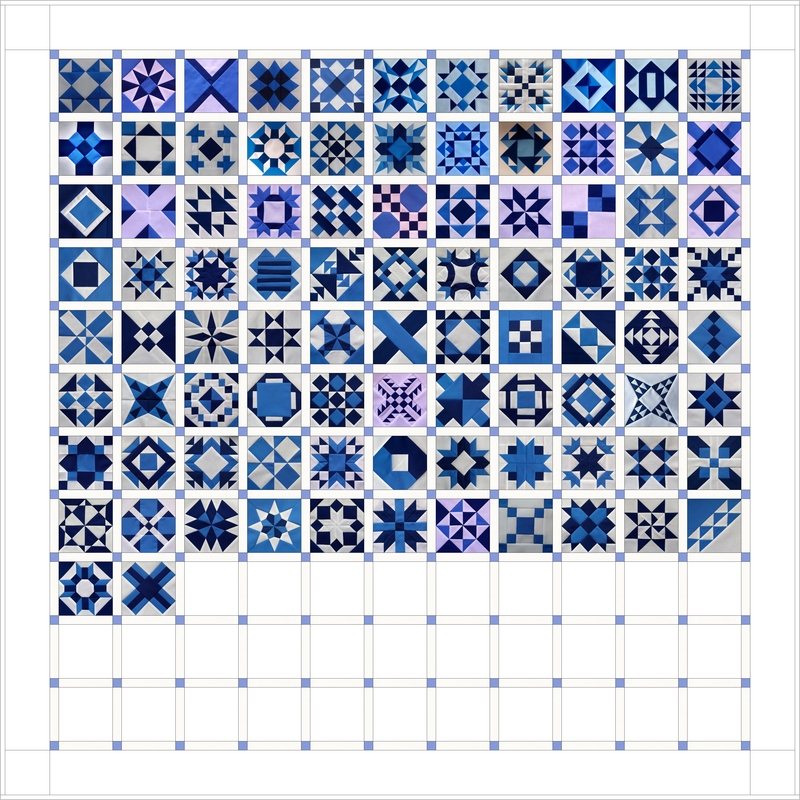 I love all those blues, my favourites. 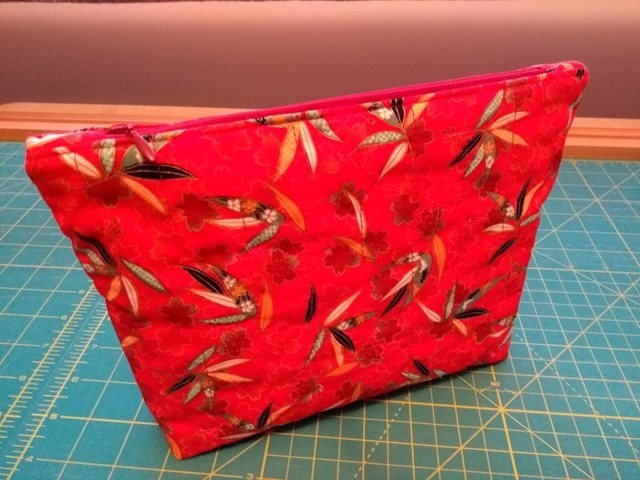 And the old sewing machine has made a lovely job of the pouch for Claire – those old Singers could sew through anything and lasted forever. Do you find it tricky to keep the wheel going while you’re sewing or does it become second nature very quickly? Thanks Kate. I learned to sew on a machine exactly like this one so it’s second nature. 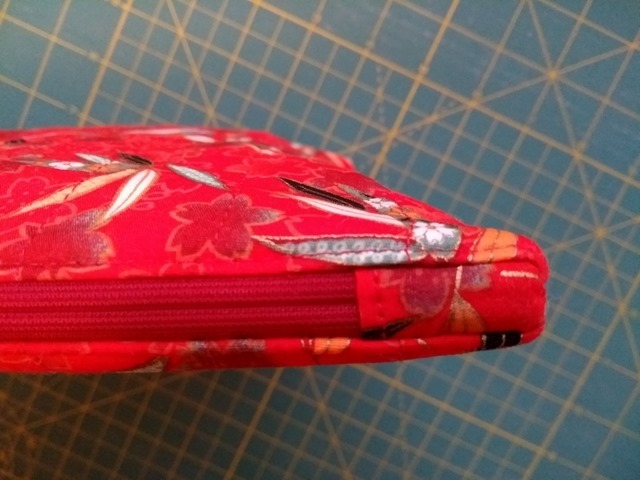 The wheel is very light t to turn so you’ve got complete control of every stitch and how fast you sew. The only problem I do have is my muscle memory. I keep pressing the non existent foot pedal! That’s what I had in mind… just like when I sew with my little Singer I keep going for the needle down button… that isn’t there. I think having learned on the hand-cranked machine must help; there’s probably a rhythm to it. I know! I don’t think I could live without it now. I’d certainly never consider buying a new machine without one. another lovely post. Those fabrics are stunning but now made into things well they come to life. 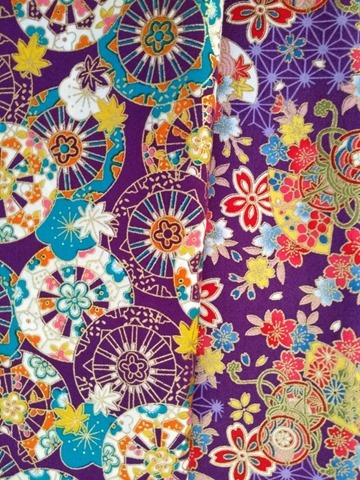 I do hope when I go to Turkey I can find some fabric!!!!! I am sure the gifts will be very well received. The green fabric should make a fantastic garment. I know you will make a good choice whatever you do with it. That colour will suit your daughter. Love the Singer by the way. That’s where the challenge gets a little tougher. She only treated herself to one yard of the green. Claire loves the bag and missed the bookmark at first because the felt was clinging to the bag lining. It was only on inspection of my workmanship i.e. turning the bag inside out, that she found the bookmark LOL. that’s it, send your daughter to distant exotic Holiday destinations, and that way, you’ll always be sure she’ll bring back gorgeous gifts lol. You are Lucky she travels so light though, and I am Lucky to have you for a friend, willing to use some of your exotic new stash on a pressie for me! Beautiful. Can’t wait to see what your finished products will be. Those fabrics are stunning. They’re all absolutely gorgeous. Your daughter brought you absolute treasures!